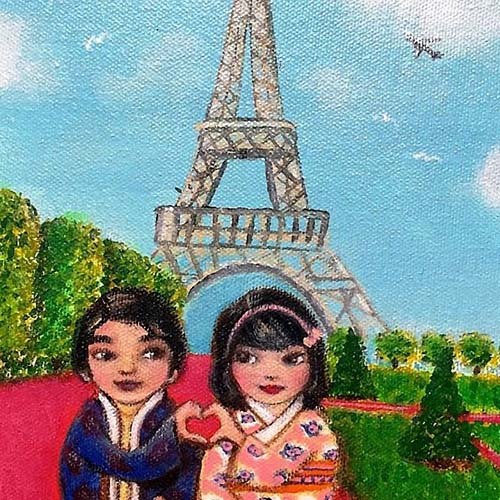 Joolie Green is the owner and creator of JOYJOart + design, painting romantic kokeshi travel couples. The kokeshi’s mission is #joinheartsfordiversity through images of friendship and sharing of cultures. While based in Sydney, Joolie is currently expanding JOYJOart into Asia. Joolie remembers her own childhood enraptured with paper dolls, and spending many hours creating her own dolls, fashion, and travel stories. Dolls and magic realism have since featured in many of her paintings and exhibitions. As an exhibiting fine artist, Joolie has been a proud sponsor of Sydney Children’s Hospital Randwick and Variety for Children on many occasions. The JOYJOart concept was born in 2014 with the JOYJO character and logo. After further character and product development in 2015, the online store was launched following local sales of kokeshi paintings and artprints. While Mei+Kenji are the launch couple, other kokeshi couples have been created with their own travel story. The JOYJOart + design studio welcomes visitors to the gallery surrounded by original paintings of kokeshi couples in romantic destinations and offers fine artprints for sale. Group visits are welcome. The studio also takes commissions for kokeshi-style portraits of clients dressed in traditional Japanese kimono.